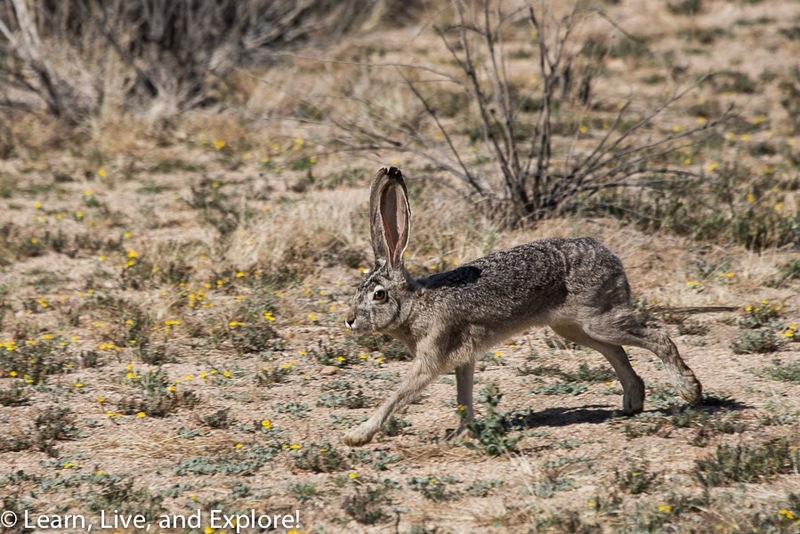 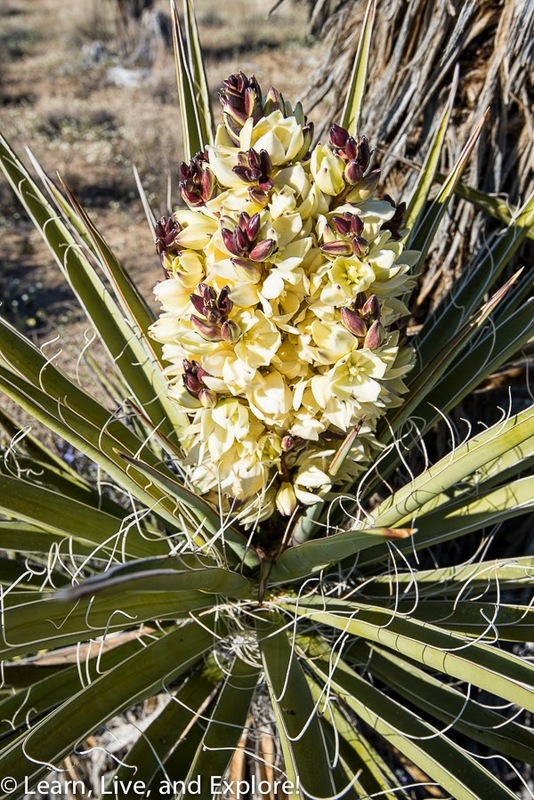 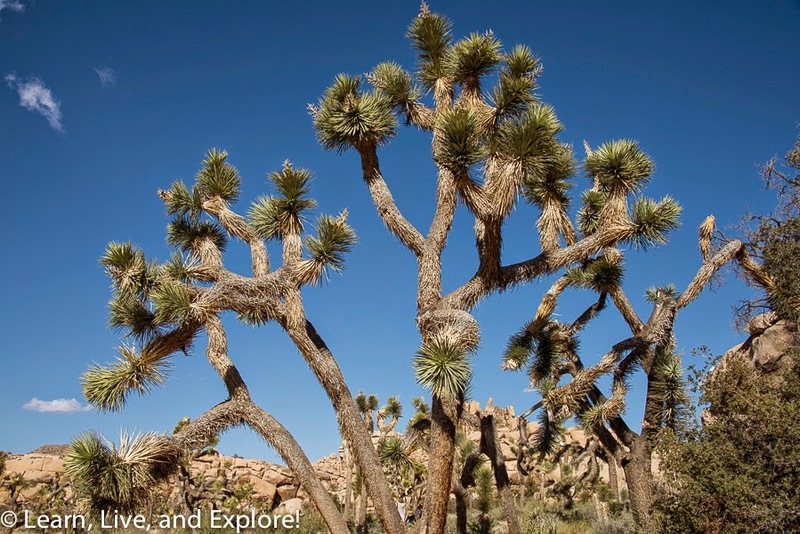 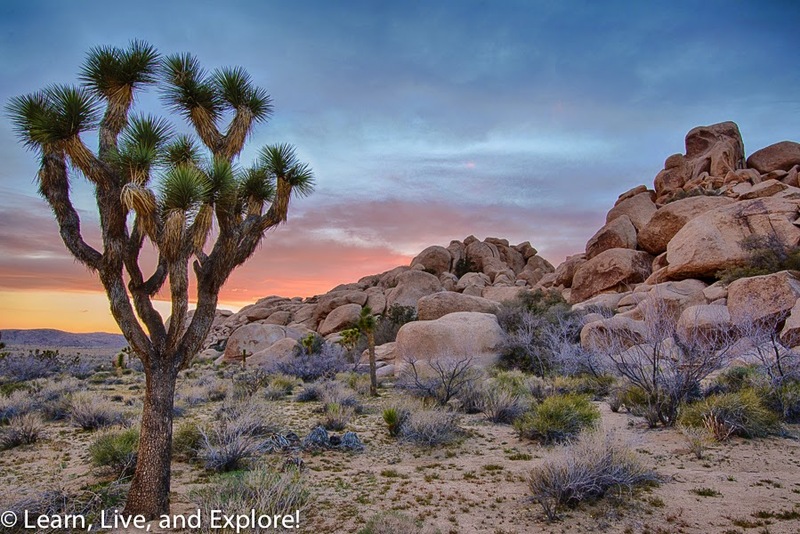 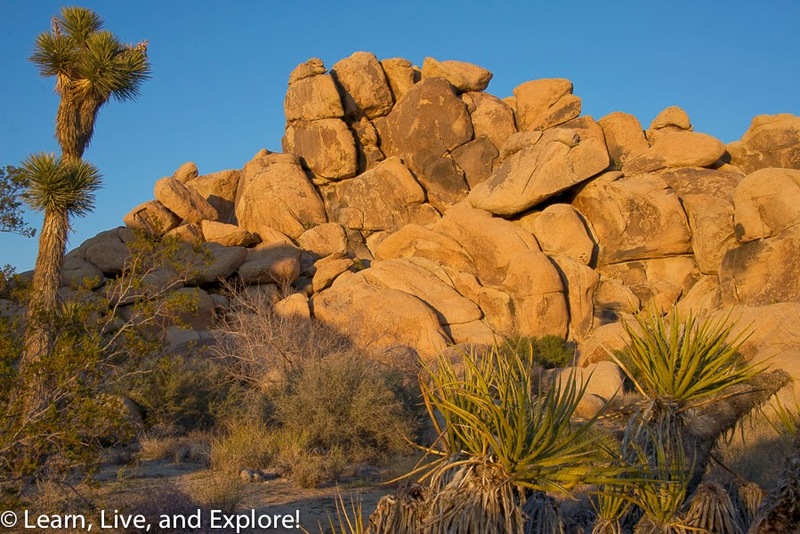 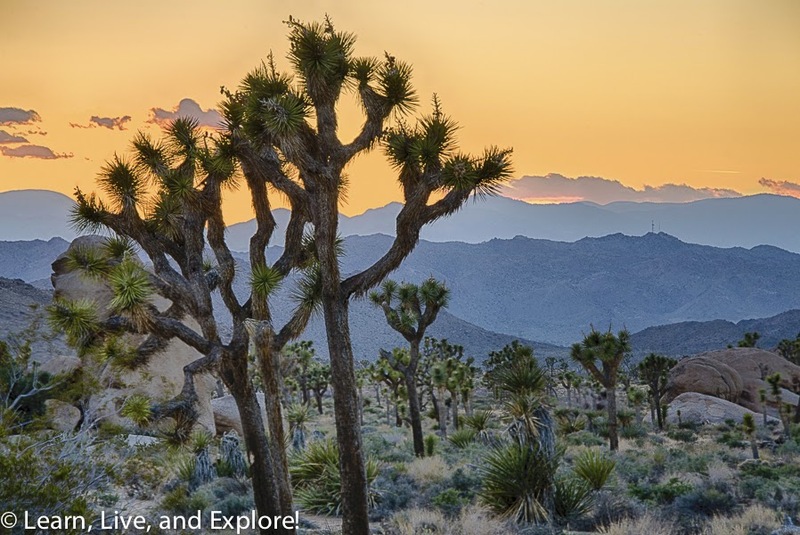 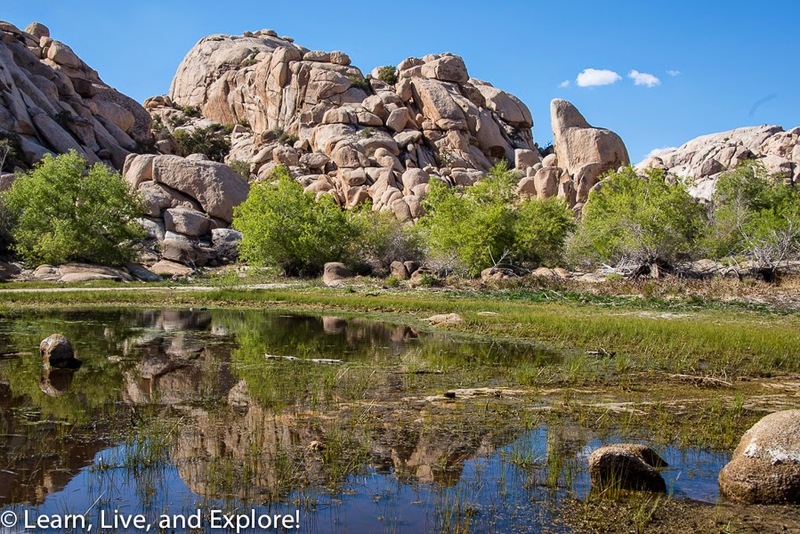 Joshua Tree National Park ~ Learn, Live, and Explore! 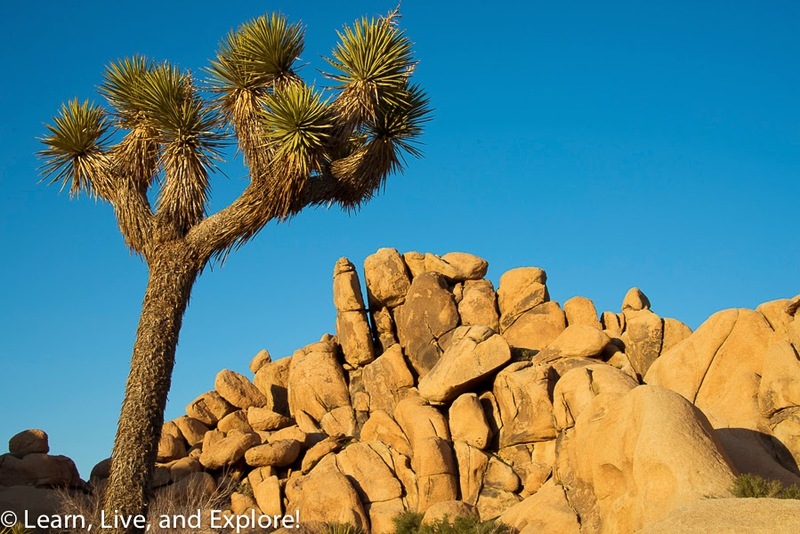 A great day trip for people heading in to the Los Angeles area on vacation is the 2-hour drive out to Palm Springs, actually just beyond Palm Springs, where you can explore Joshua Tree National Park. 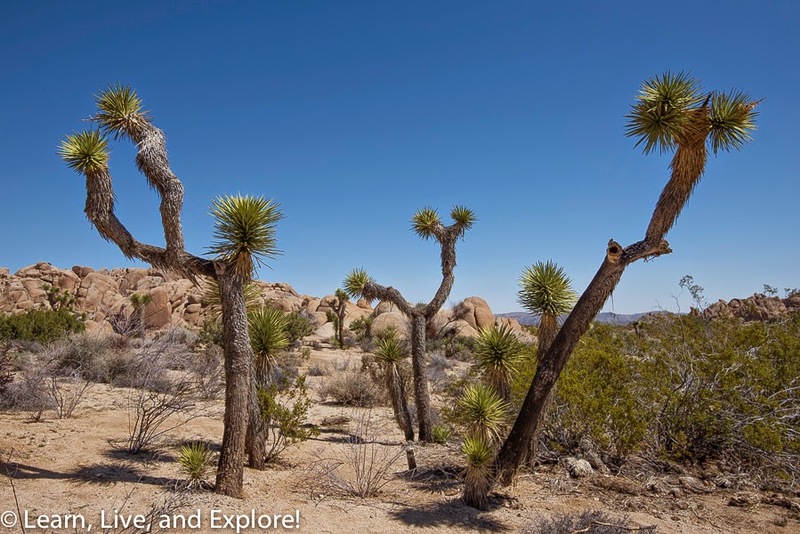 I like to think of it as less of a National Park and more of a Dr. Seuss book set on the moon because the joshua trees look just like the spiky pom-pom trees from the illustrations in his books, of course not hot pink and blue. 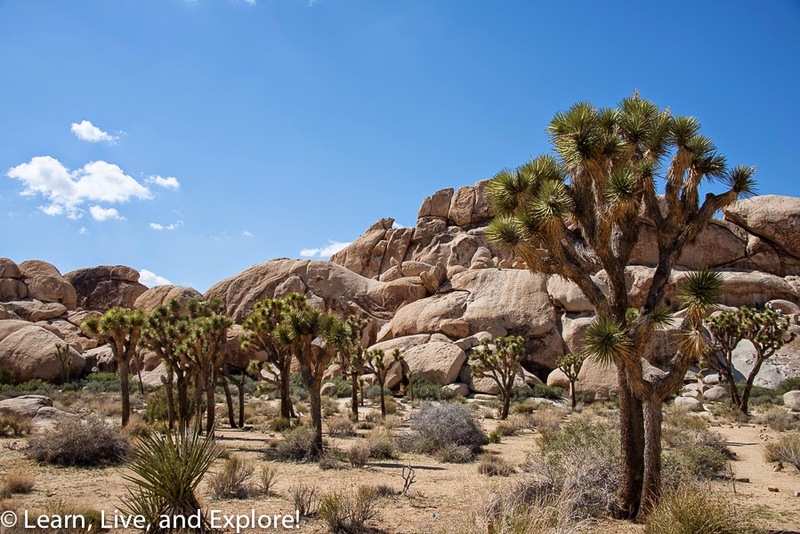 The park is easy to do in one day, with most of the attractions located in the northern half. 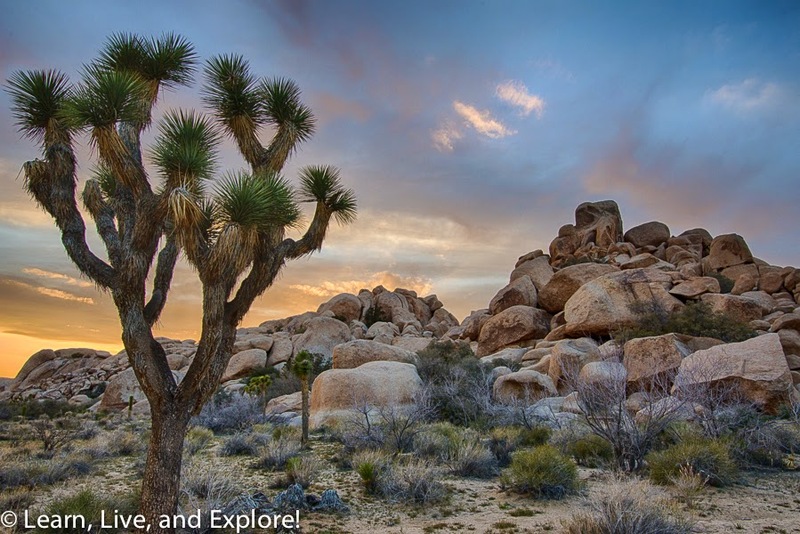 Photography-wise, the checklist includes several neat rock formations, the joshua trees themselves, other desert plants, and sunset/night photography - weather permitting. 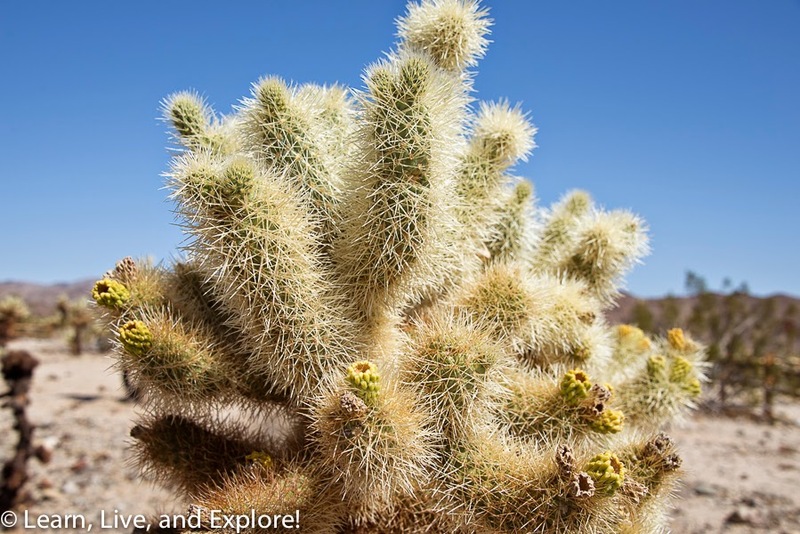 Driving north from the south entrance, you will reach the cholla cactus garden as your first stop, then Arch Rock is a good first mini-hike. 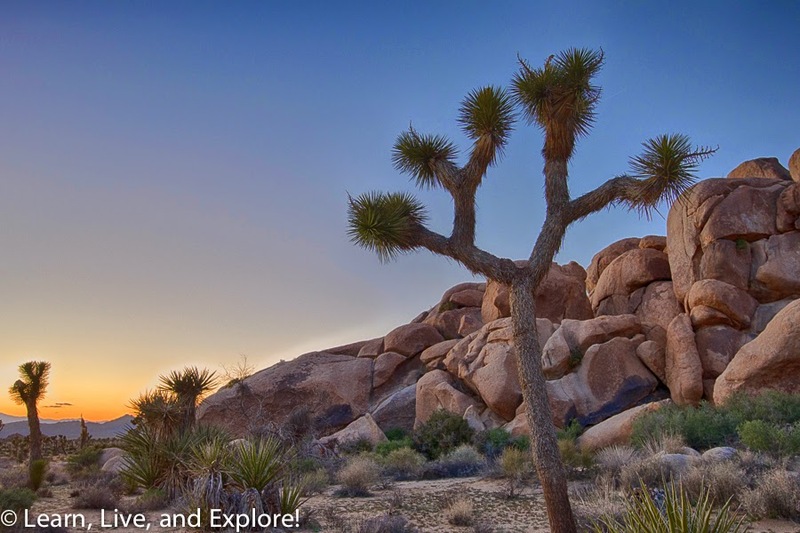 I would think if you could somehow time it to capture the sun rising through the arch, that would be beautiful! 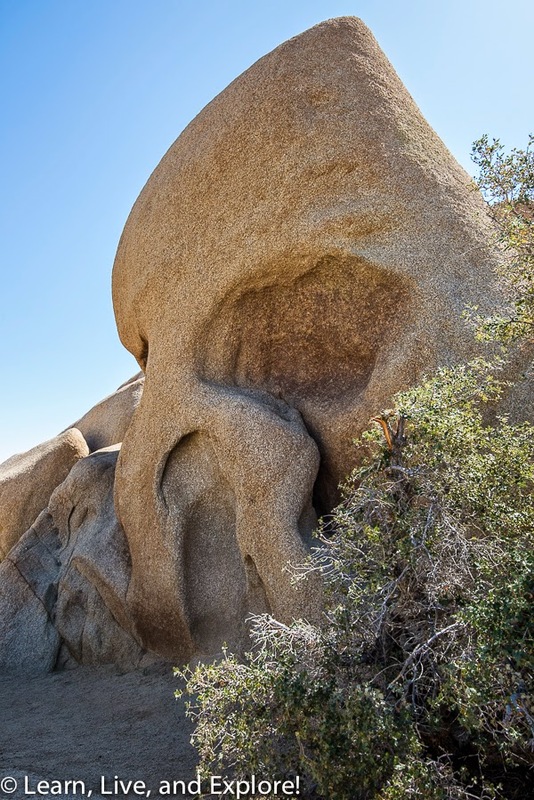 Jumbo Rocks campground has some interesting rocks, including Skull Rock. 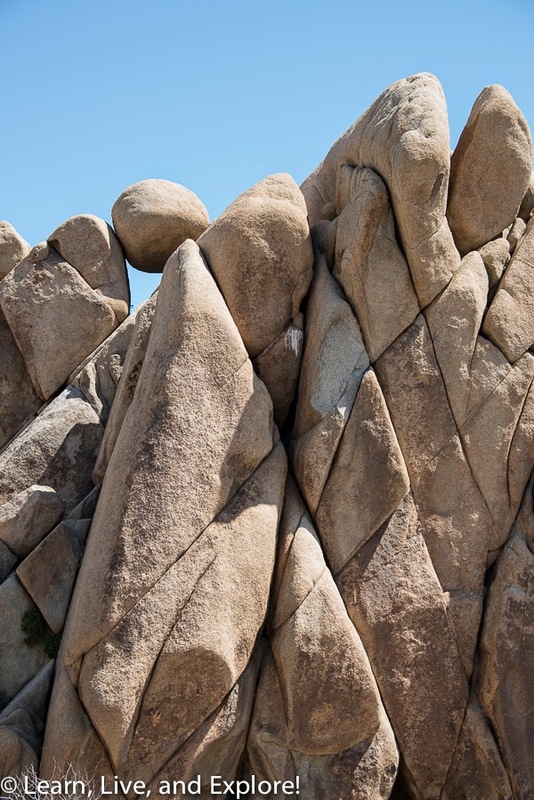 Hidden Valley is also filled with more climbable granite boulders. 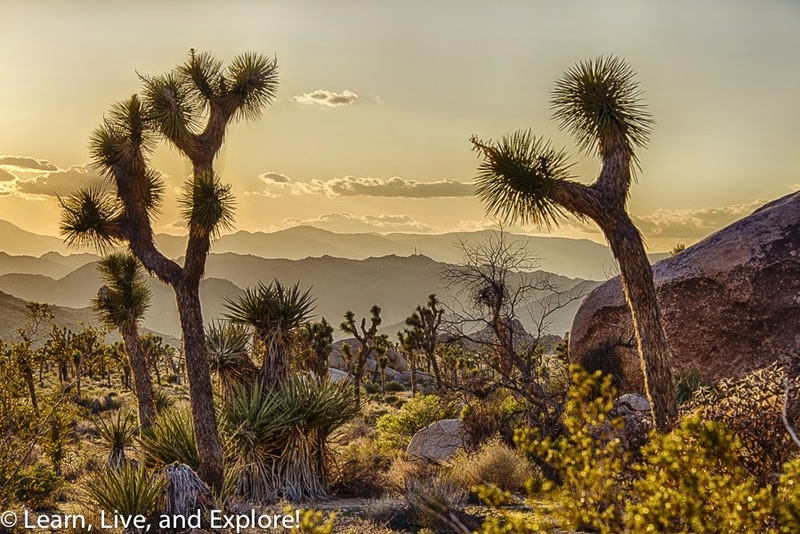 Of course, Keys View is where you need to go to see the Cochella Valley and the Salton Sea from the 5,200 foot viewpoint. 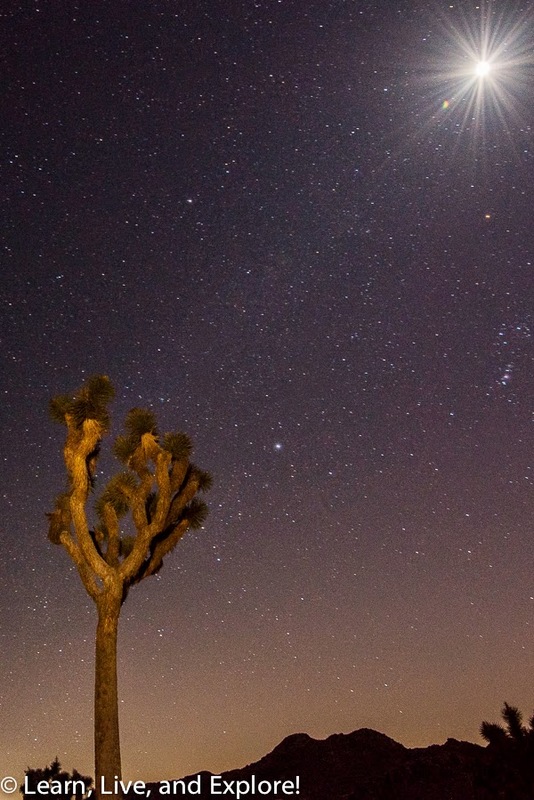 Night photography is fun if the sky is clear because there is not a lot of ambient light, though airplanes always seem to sneak into long exposure shots! 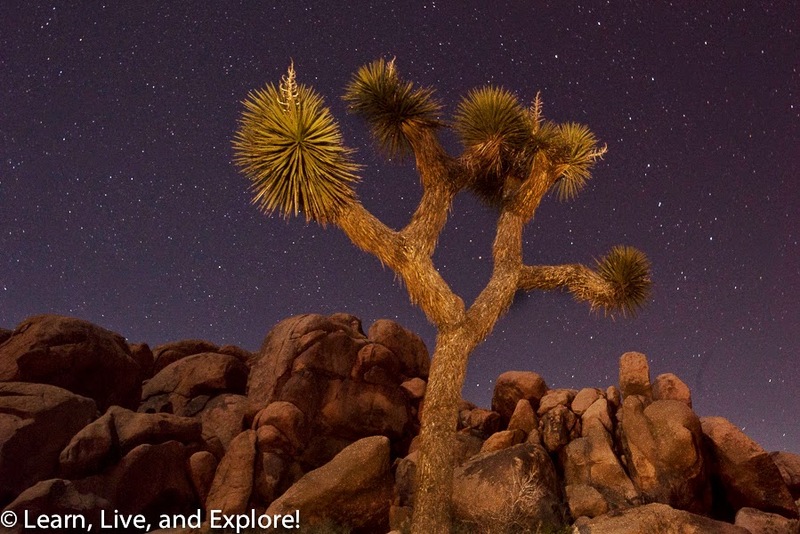 Practically any turnoff with joshua trees and rocks is a good spot to play with the late hours of the day. 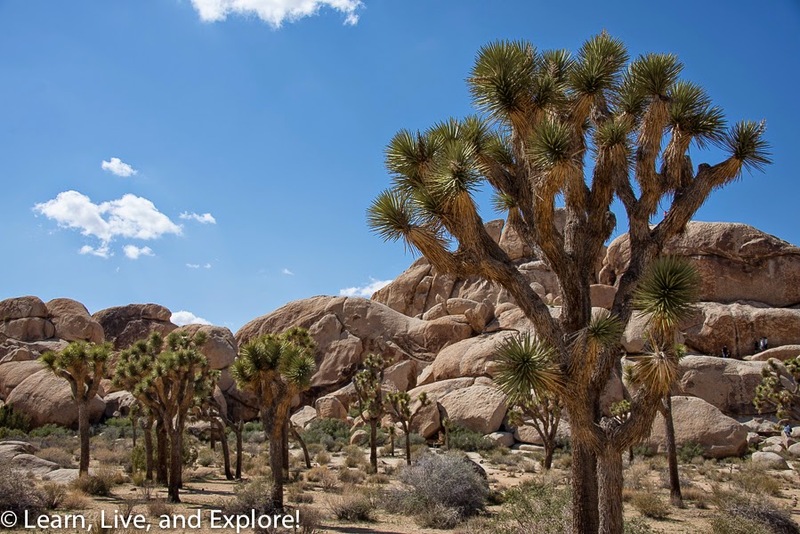 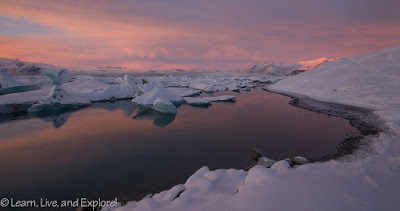 I think the ideal scenario for more than a day trip, and assuming you are into camping, is to get a spot inside one of the many park campgrounds rather than doing the long drive to, through, and back from the park. 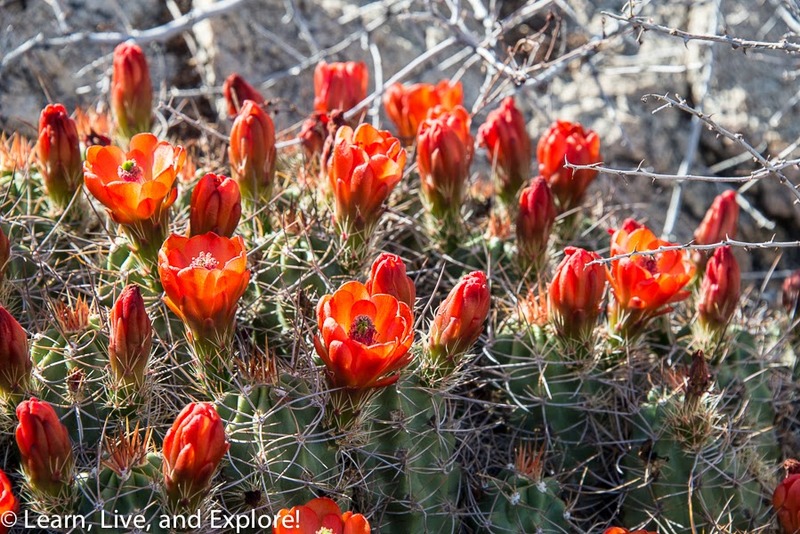 Best time of year to go is in the early spring before the weather gets too hot and when the wildflowers should be blooming. 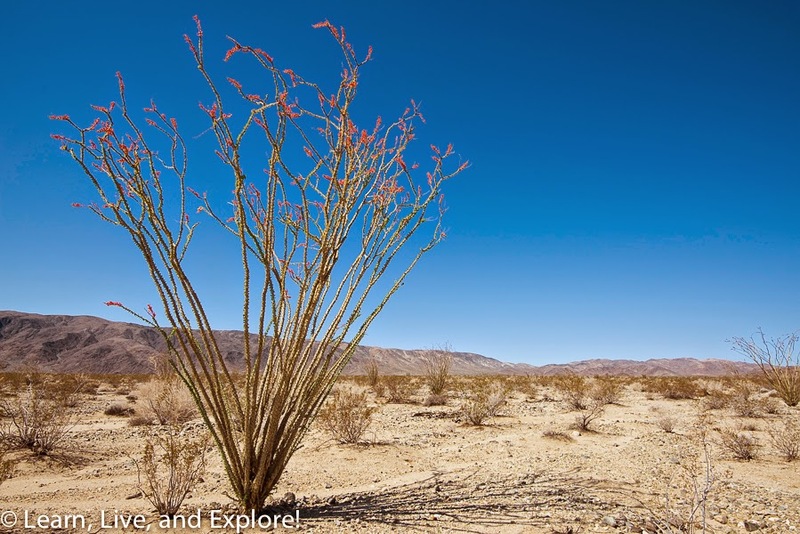 Of course you need to monitor the calendar because the Cochella and Stagecoach Music Festivals also tend to be around the same time of year. 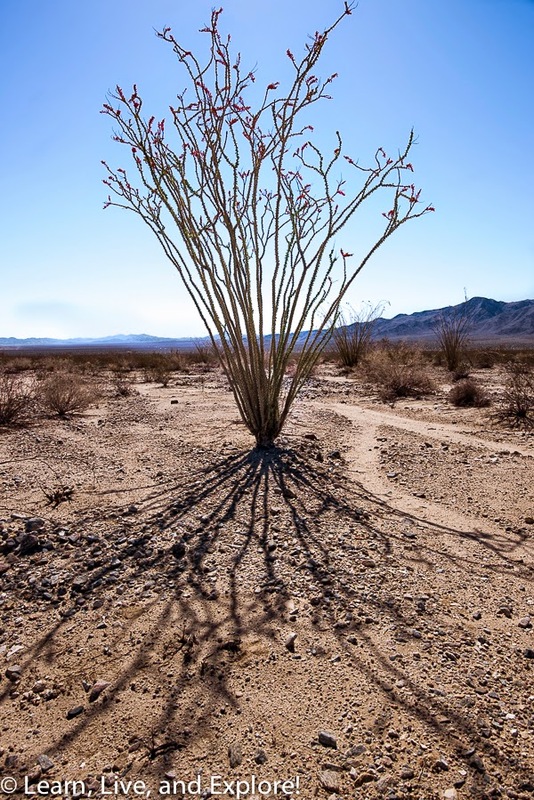 Here are some of my favorite photographs from a past trip. 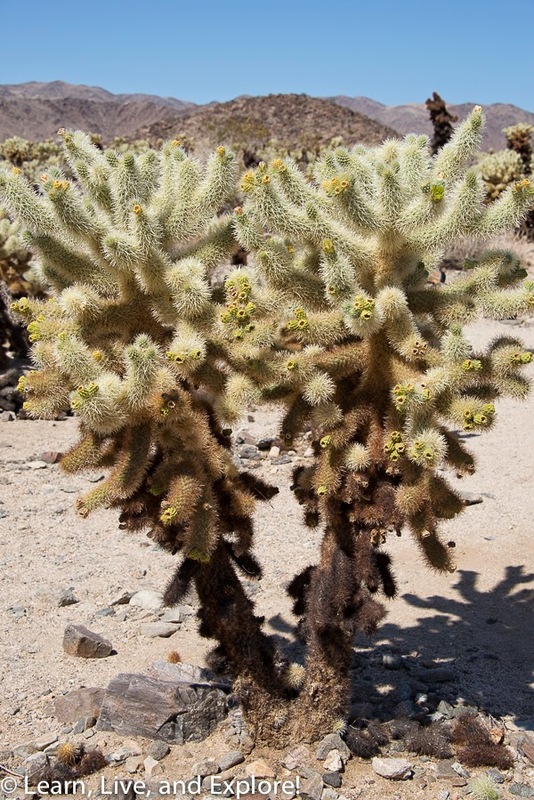 Cholla Cactus Garden...be careful, their nickname is jumping cactus for a reason! 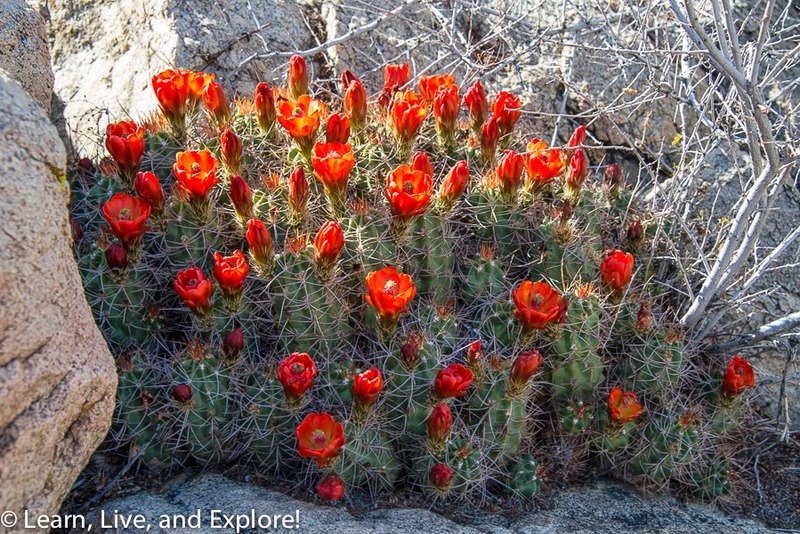 If you bump one, you're likely to take a cactus souvenir home with you! 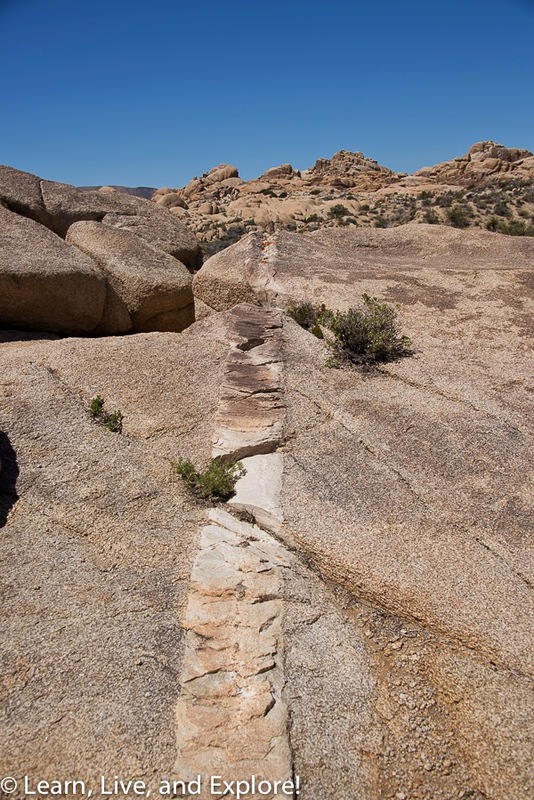 A natural rock dyke formation...geology blows my mind sometimes! 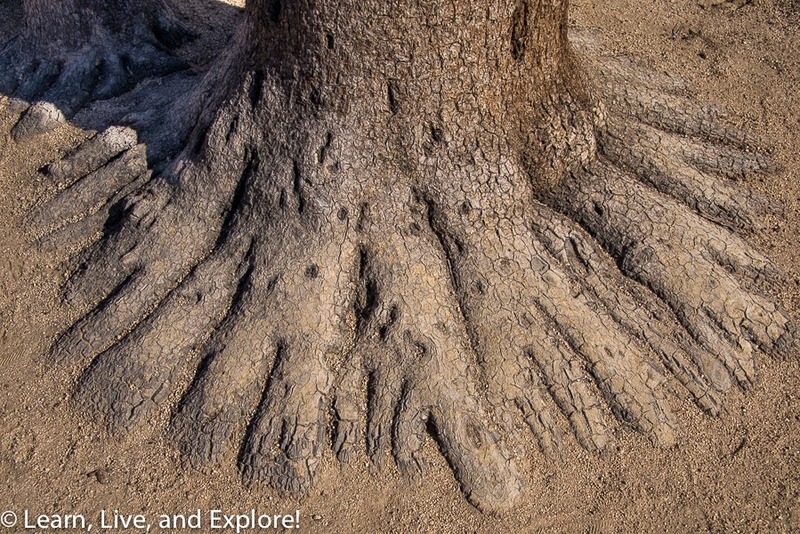 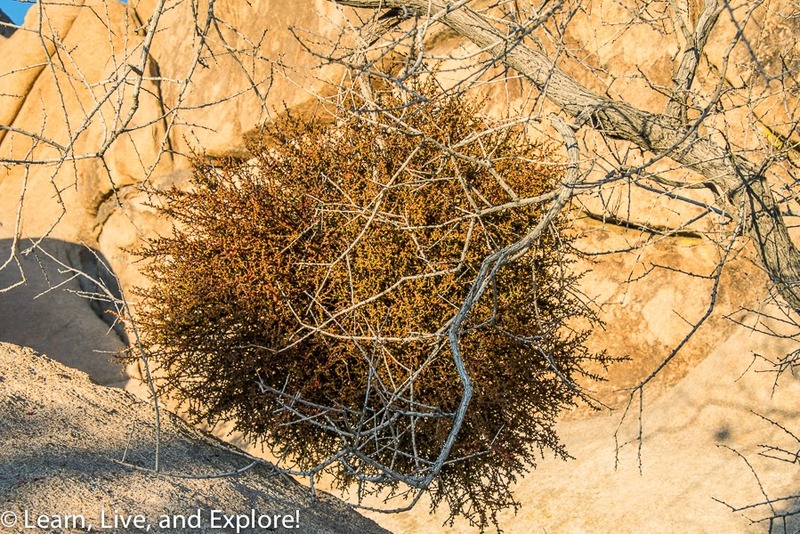 The roots of a Joshua Tree look like lots of troll feet! 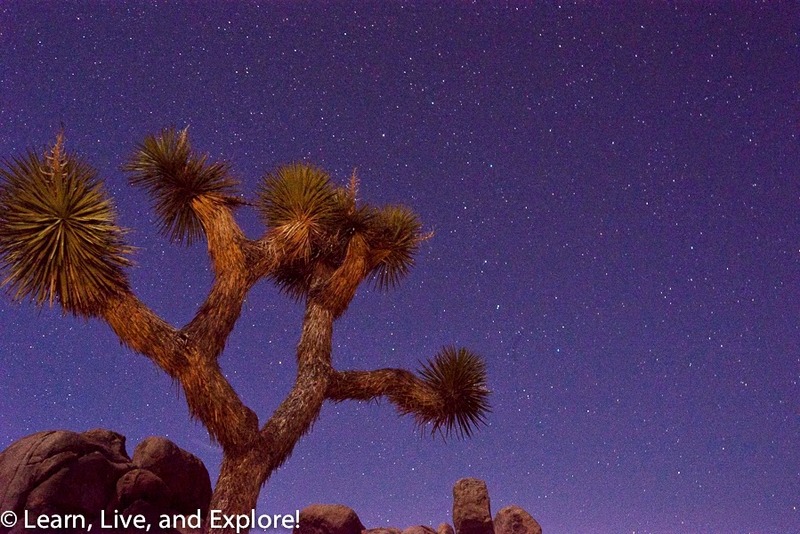 Can you see the big dipper in this one? 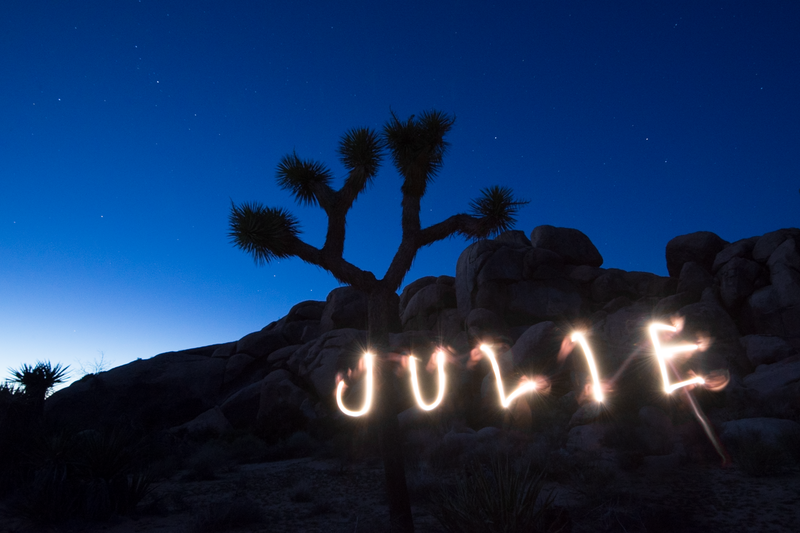 Long exposure moon creates crazy spotlight affect! 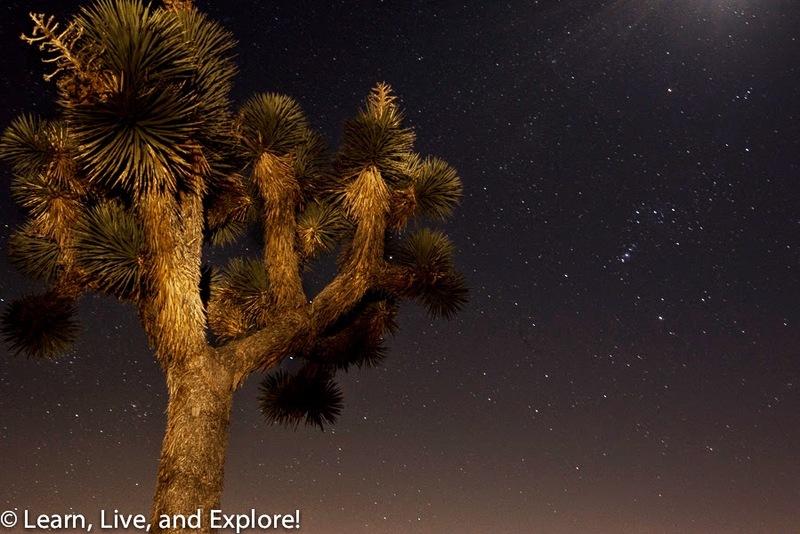 Can you spot Orion in this one?